NorArgo2 will operate and maintain an array of 32 autonomous vertical profiling floats, Argo floats, in the Arctic. They will provide real-time vertical profiles of pressure, temperature, salinity and additional biogeochemical parameters, as well as drift velocity of the floats. NorArgo2 will be based on the proven profiling float technology used in the international Argo. Profiling floats are free drifting, battery powered platforms, 2 m long, that usually park at 1000 m depth where they drift with the currents for 10 days and then descend to 2000 m before they rise to the surface (Figure). They adjust their depth by changing their buoyance using a hydraulic pump system. Physical and BGC-data are collected during the ascent and reported at specified depth interval. 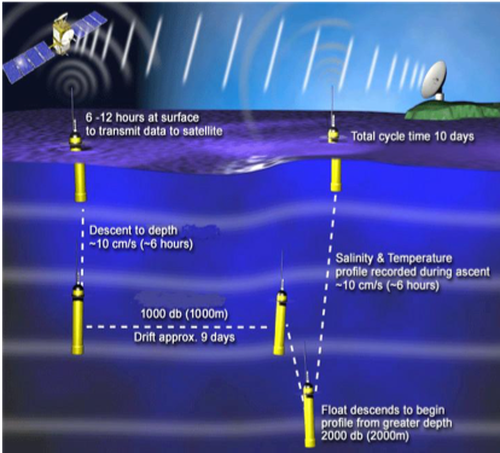 At the surface, float position is determined by GPS and the observed data are transmitted via an Iridium satellite communication system to a shore-based server (minutes of duration). The float then returns to its parking depth to repeat the cycle in excess of 200 times over the course of five years or more. In some shallower areas the parking and profiling depths need to be changed to shallower depths. 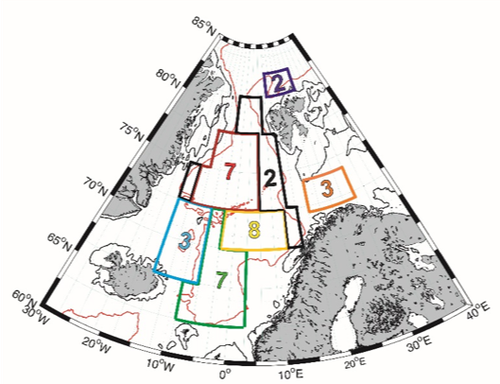 The array with ~30 operative floats include the Nordic Seas, Barents Sea and north of Svalbard. 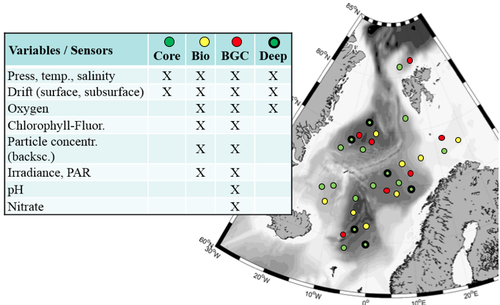 The targets of operative floats for the different areas are shown in the figure. The Argo floats will carry various sensors (pressure, temperature, salinity, oxygen, pH, nitrate, etc.) and be operative in different ocean areas. The target of operative floats, carrying various sensors, within the different areas are seen in the figure. Figure 2. Schematic view of locations of operational Argo floats for the different float types. The different float types are Argo floats equipped with variety of sensors which are listed in the table.